Funeral Liturgy was Celebrated on Tuesday, August 13, 2013 at 10:30 a.m. in St. John Brebeuf Roman Catholic Church, 1707 St. John Brebeuf Place, with Rev. Fr. Mark Tarrant, presiding. Winnipeg Funeral Director, Richard Wojcik of Wojcik’s Funeral Chapel & Crematorium, 2157 Portage Avenue, Winnipeg, in care of arrangements wojciksfuneralchapel.com, 204 897 – 4665. 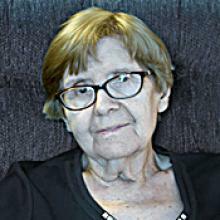 MARIA CRUZ BUCHOK Peacefully, on Wednesday, August 7, 2013, at her home, Maria Cruz Buchok passed away with her children at her bedside. Left to forever cherish Maria Cruz are her spouse of 63 years, Dr. Roman Buchok, currently a resident at Extendicare Tuxedo Villa in Winnipeg; their five children: Roman (Marie) and their children Roman Alexander, Kathleen (Justin) and Celia; George (Marsha) and their children James, Thomas and Anna; Carmen (Jack) and their children John Roman, Andrew (Ashley) and Katie (Jason); Linda; Jim (Pamela) and their children Matthew, Sacha and James; great-grandchildren Nola (Kathleen) and Alice (Katie); as well as by numerous nieces, nephews, and great-nieces and great-nephews in Spain. Maria Cruz was born May 3, 1924 in Madrid, Spain. She immigrated to Canada with her husband and their infant son Roman in 1952. Funeral Liturgy will be Celebrated on Tuesday, August 13, 2013 at 10:30 a.m. in St. John Brebeuf Roman Catholic Church, 1707 St. John Brebeuf Place, with Rev. Fr. Mark Tarrant, presiding. In lieu of flowers, donations may be made to St. Paul’s High School in support of the Student Bursary Fund, 2200 Grant Avenue, Winnipeg, MB R3P 0P8. Winnipeg Funeral Director, Richard Wojcik of Wojcik’s Funeral Chapel & Crematorium, 2157 Portage Avenue, Winnipeg, in care of arrangements, wojciksfuneralchapel.com, ph. 204-897-4665.